We have a number of jewelry pieces in the “Gallery on the Lake” in Buckhorn, Ontatio. From time to time they also sell one of my Medicine Pouches there and so the gallery owner knows about my work as a shaman. 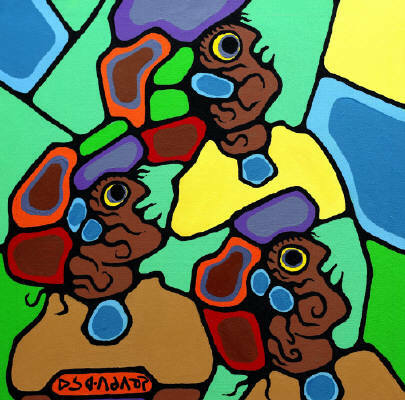 Shamanism, the Spirit World of his people and their lore and legends also were the main focus of Native artist Norval Morrisseau’s art and several of his paintings are still available through this gallery. Recently I was asked by the owner to look at 2 of the paintings of Morrisseau and write a short intuitive interpretation of what I see. 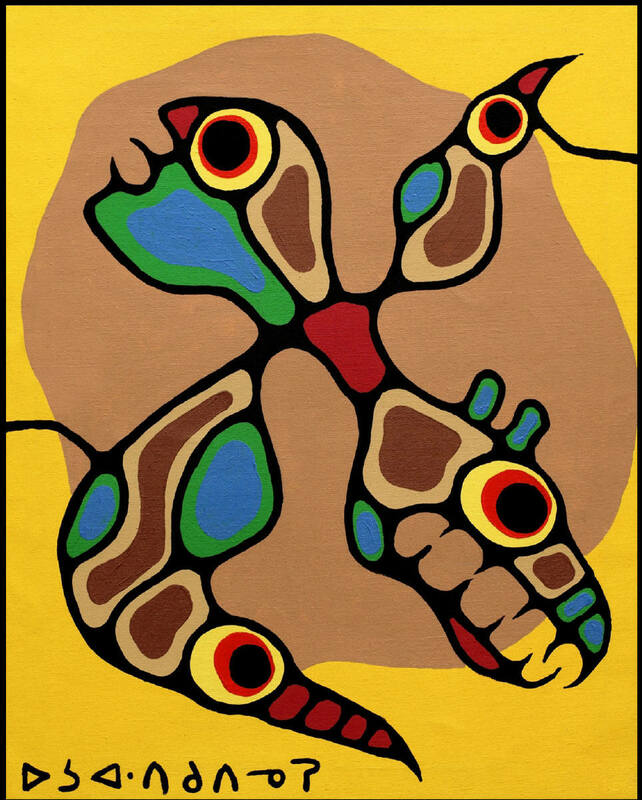 In his familiar highly stylized format, the Artist, Norval Morrisseau depicted 2 indigenous persons looking up. The artist was himself deeply immersed in the shamanistic worldview of his people, the Anishnabe of Northwestern Ontario. The painting reflects the color schemes of his people: primary colors, reds, greens, blues, yellows with black lines surrounding them. The mouth of any Being depicted, is emphasized as the most important part, as it “speaks about the Spirit” of the Being, shows its soul, while the eyes are seen as the windows (pools) into its soul. Since the painting is called Shaman People I feel save to say, that we are looking at 3 shamans, looking in the same direction. The colors are light with yellow in the uppermost corner, which I feel, indicates they are looking at the morning sun, watching the sun rise and may very well be chanting their Morning Prayers to Gemnedoo, Great Spirit. Upper World: The realm of the archetypal Manitous, guides and teachers, that advise every shaman. – or is there a shaman calling his I her Spirit helpers and we see a Spirit from each of the 3 realms answering the call? Keeping in mind the mentioned background of the artist and his interest in shamanism as well as the title of the painting “Inorganics” I feel save to say, that we are here looking at a Spirit Being. It is partly human, partly Bear and partly Bird. The human head, again with prominent mouth and eye is the human striving ever upwards to and beyond the limits of human knowledge and experience. The 2 Bird / allies give the shaman the ability to fly into any of the 3 previously mentioned realms, one looking up, one looking back from where the Spirit being originated. The most intriguing Spirit part however is the Bear, huge, heavy, fierce facial features, it speaks of the weight of the animal instinct, of the body, of the fierceness of the emotions and of the essentially earth-bound human existence. Maqua, the Bear is the Power of the unconscious, the dreaming, the wisdom within our dreams, the inner teachings we all carry. 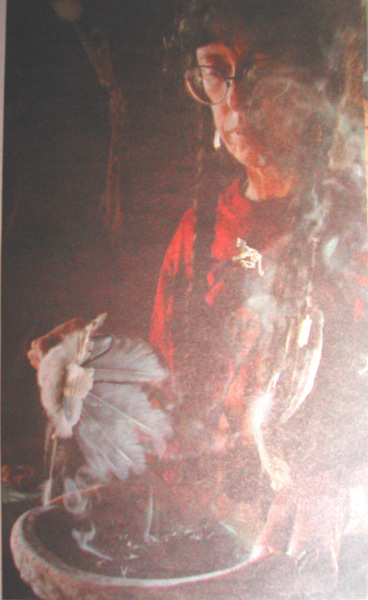 But Maqua is also the fierce powerful healer, that gives the wisdom about healing plants to his human brothers and sisters, the one invited into the Midewewin Healing lodge. The larger Bird in front is looking back upon the weighty earth-bound Maqua. He reminds me of Zhashagi, the Heron, mighty clan totem of the Anishnabe, the leader of the way, but also the pragmatist that keeps order within the circle. 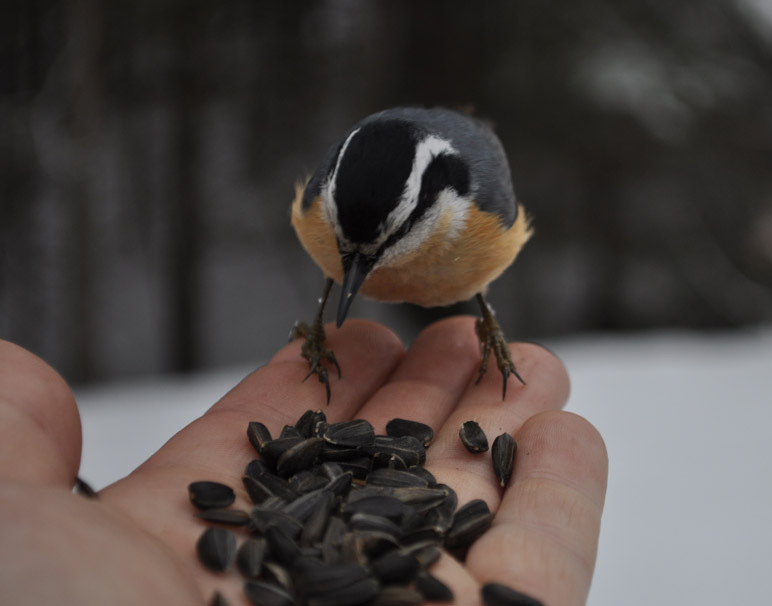 While Zhashagi keeps order there is Gigiganenshii’, the Chickadee, who is the bringer of joy and spontaneity. The red center of the painting may very well be the standing for heart. I venture to say, that the Spirit Being we see here is the human soul with all its parts well integrated and on its flight into the light of the setting sun. I can not fix problems, but I could maybe find out, why the problem is there….. They are a young couple, he Korean, she originally from New Zealand married since 7 years, no baby – in spite of 2 expensive rounds of IVF. She was on antidepressants but would need to get of them to start another round of IVF. He is a carrier man – not used to not get his way….. He had given offerings, flowers, prayers, also money for a kinder garden back in Korea…… A Mundang had told him, all was well, but – why this problem? I feel sorry for Nina. She looks sad and exhausted and a little embarrassed. She would do anything, not to be the problem anymore…. I take them upstairs, put Nina onto the Bear fur, fiddle with my broken old stereo, until it agrees to play my old drumming tape, then pick up my drum and call my Spirits. The whole gang arrives quickly and settles around Nina, who looks, as if she had gone to sleep. Harry sits in the rocking chair with Fretty at his feet…. So he is not the problem …. Good to know….. I drum and then sit on my Reindeer fur and let the trance wash me away. Lira flies ahead through a dark snowy landscape to a bright hole in the sky ahead. I hurry to follow her. Finally we get there. It had gotten mighty big and it smells like flowers and honey. Bursting out into the light, Lira changes into a Parrot with bright red and blue plumage. I find myself on a large sunny terrace, made from brown clinker, there are terracotta flowerpots everywhere and every imaginable flower of every color is growing in them. There is a colorful umbrella and deck chairs, a multitude of small Birds are singing. It is very warm. Above the Bird song I make out a voice: ”Ammah! Ammah it says. Ammah? I try to think, always a bad idea during trance the scene wavers and almost bursts. The loving face of my friend Anne shimmers through the sun light. Yölle, the sun is getting bigger and bigger, engulfing everything in searing yellow. The sun chant! “ Yölle and Ammah” the Parrot caws…. and I see Anne’s face floating over the terrace, while Yölle herself is still getting bigger and bigger….. the brick wall behind me is getting hotter and hotter and I feel myself melting. Anne floating on a sunny terrace? I try to think, before I melt away, while all the Flowers and Birds on the terrace are unaffected by the heat. Ammah is what Ann’s grand children call her! then the scene dissolves – just melts like yellow butter. Back on my Reindeer fur I drum over Nina for a while, , then let the drum sound fade out and after both charges are awake I take them downstairs and out onto our upper deck, I make Nina sit in the warm afternoon Sun. I make her put her face right into the Sun, tell her to soak it up. Because THAT is, what she neeeeeeds! I ask, when Nina came to Canada. 4 years ago, in October…. She works in a ………(emitted) company in an open concept office cubicle in Mississauga. It is a 9 to 5 job. Then home on the subway. They have a nice large condo in another highrise with all the amenities right there – yes, unfortunately facing away from the lake, but lake view is too expensive…. Well, away from the lake means facing North = NO Sun! No Sun all day for a person from New Zealand with some Maori ancestry? She came here in the fall, when it gets quite dark, the no Sun, and quite cooooold time. Then she lost the baby and fell into depression and now can not climb out again… out of the dark hole. Amaterasu, the Japanese Sun Goddess, so the legend goes, was in a dark cave and did not want to come out, until someone shone a bright light into her cave and she could feel joy again. Amaterasu is an excellent picture for SAD = seasonal Affective Disorder. Come out of the cave, Nina, sit in the sun, have your office moved – or at least get yourself a full spectrum lamp. One for the office and one for home. Move condos , not to lake view = South, but to West, where you get some Sun in the evening, when you get home. Harry has his blackberry (or is it a smart phone??) out, gooooogeling SAD and the prices of bright full spectrum light lamps. He now knows what to do. She says, she can not belief it – yet,- but she can feel it. I am pleased but direct our talk towards observing and ultimately controlling depressive thoughts and ruminations as well as negative self talk….. They both are getting homework to improve in this area. I am having a hard time describing the card. This is, as if S and J are standing before me, right now, holding baby Willow. See, Willow, Willow was not supposed to be here…. …………….or maybe she was…. . Sometimes things go VERY wrong…..
Hydrops fetalis is one of these things. S found out in week 21 of her pregnancy – and decided against a late abortion. Willow was born still, but modern medicine knows a lot of tricks and they got the heart going again…. and she went on a ventilator – and she had 9 surgeries to fix/ manage the hydrops and several other problems like a closed left lung, a none functioning stomach and ….. a loooooong list…..
Slooooly but surely S and J recognized the “hounds of hell,” that rode over their little family. Yes, modern medicine tried EVERYTHING. And S and J and Willow suffered through everything. Somehow they had heard of scruffy little me and came, wanting to know, if I could help. Journeying showed, that Willow’s Spirit was not in her body – not since she left the womb. Willow’s Spirit was back on the Tree of Life, where it belonged…. And no, you do not have to give up being a christian in order to come here and …. You are her parents and the unthinkable is to allow Willow’s body to return home. turn of the machines and the Spirit of Mercy took her physical form away, back into the loving arms of Umai Ee’ne, the Earth Mother. and race through the nightmares of S.
When will their hoof beat subside? Sunday they will come out to my house. We will sing lullabies to Spirit baby Willow. I had this deck on my wish list for ages. Now, when I look at it I am wondering: What was I thinking!!?? -Well, it was back in the time, when I was on strict dial up and could not look at scans of decks or load the web sites of deck creators. Yesterday I looked through the cards, and honestly, there are just 25 cards I like and from these only 3 I really like…. So many others are – what I feel as being “tacky” or “kitsch”. Today I did not dare to use it for a reading for a client… It just did not feel right at all. 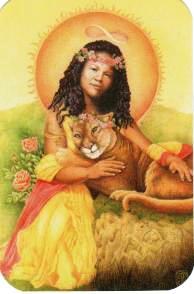 Strength is a good card for me today, reminding me, – to use what I know I have at my disposal. I do NOT like this card image at all! I do not even want to describe it. A baby lion with a crown of pink flowers on his head being cradled by a dreamy looking lady dressed in pink and yellow scarves and …. ….oh forget it all, to me THAT is kitsch! The word invokes a very specific meaning deep in my knowledge and experience base: Child of Water is one of the 2 hero twins of the Dine’h Nation. The one, that knows the trance and knows how to heal and taught all the healing sings to the humans…. I have a very special connection to that one. My Inde’ teacher was also called a ‘tubadejine’ …. 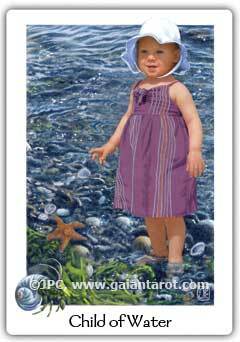 On the card however, there is a scene like on the water’s edge at a lake.Sea weed, shells in crystal clear water, a star Fish, a hermit crab. This is a REAL child = someone’s kid! I am thrown out of whatever I was thinking and I have the feeling, I have to know this child = who’s kid this is…. It is a photograph… put into the image….. 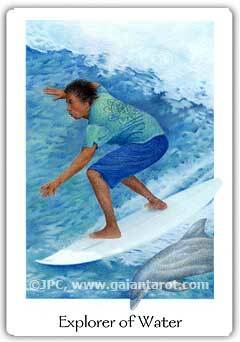 Somehow this kills this being a Tarot card – for me…. He looks quite like a Neanderthal youth…. from the facial features….. the fleeing chin… I still have my brain stuck in the Tarot of the Origins…. 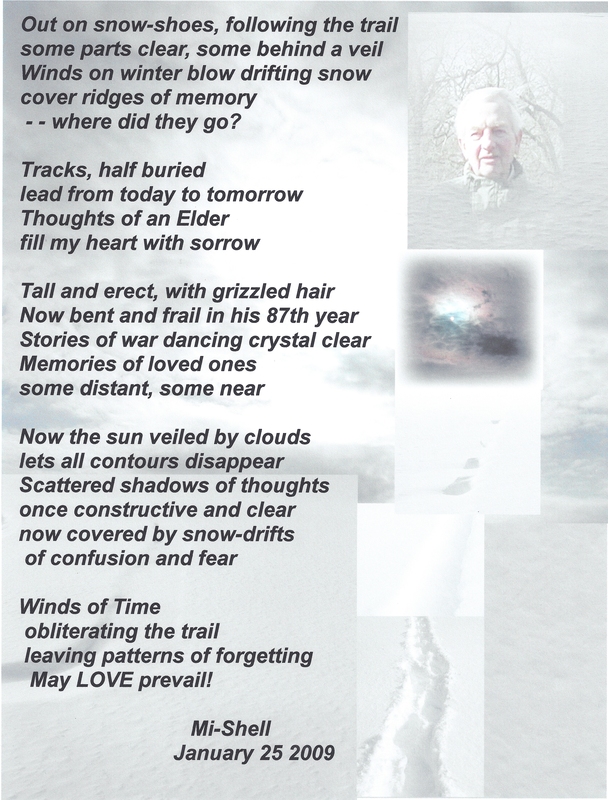 The card’s message = fast forward into the present…. A woman with dark hair is swimming in green ?? clear water. The shore with rocks and Tree stumps is visible in the background. Again, the feeling, that I am supposed to know this woman, She is on/ in other cards too. I am not in the “in crowd” I am not part of the inside information. I should go into the web site and look the card up. But I do not feel like sitting on the computer doing this. Life happens AWAY from the pooooooter!!! This photograph tells me nothing about today. Its message to me?? go swimming?????? Stay above water?? immerse yourself??? Move on your own power through a different element? Be a woman out in Nature? I an that. It is +2C the creek is ice covered. 3 crows are slip/sliding around there. Not time to jump in for me…. I will immerse myself in my day…..
That one is a nice card! 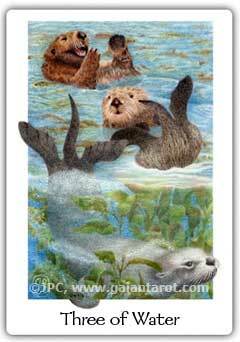 3 sea Otters are playing in a kelp bed. Otters are forever playful and gregarious. We here have a family of river otters and now is the time to watch them playing on the rapidly melting ice, sliding from hole to hole, chasing each other, sliddering and splashing in the melt water. What a nice site to see. the card helps to up-lift my gloomy mood. 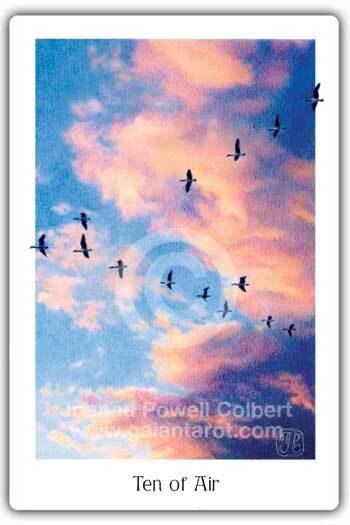 is a beautiful card:14 large magnificent Birds (Canada Geese? or Sandhill Cranes??) are flying in formation before the backdrop of beautiful sun-lit rosy purple clouds. 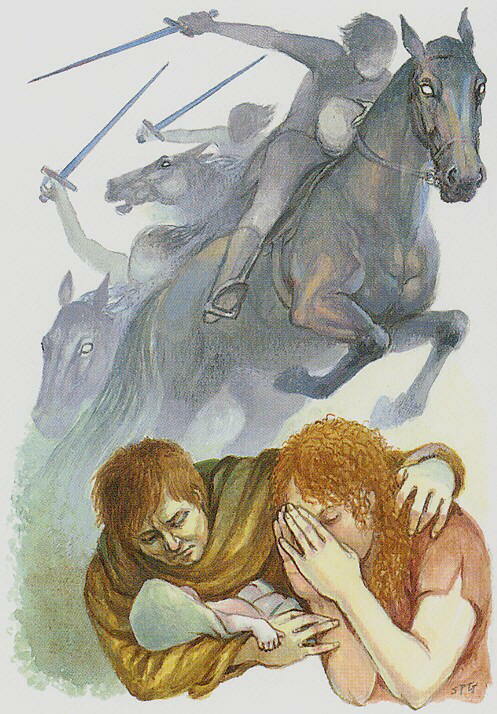 they are telling me, to rise above it, move on, but I am in 10 of Swords mood – since a few days now. By now I am sure, Skitter has been killed, most likely by one of the many large predators out there, starving at this time of the year and just waiting for a happy, well fed young Raccoon to bumble along. It is true, the air outside is filled with Birds returning. Spring is here. I am frozen in sadness. I try nor to think about it, but that does not work. The forest is burning – on the card only – for now…. 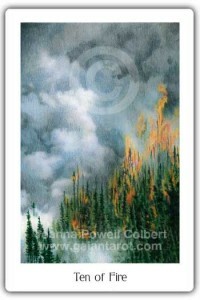 thick smoke billows up, partially blackens out a rising slope on which mature Black Spruce Trees are fully engulfed in flames. What will be left after this is utter destruction and a charred blackened Earth. But Black Spruce have cones, that will only open during a fire and only then release their seeds into the charcoal covered ground they need for germination. Here, today in mid March we have + 15 Celsius at 10.00 am. It is at least 10 degrees too warm-about 12-15 degrees above what used to be normal for this time of year. If this trend continues for the rest of the year as it has during this month – and as it is predicted by the weather experts, we will have a “summer of death as they already are beginning to call it. Scorching heat, tornadoes and heavy thunderstorms – like the one we had yesterday, when my house was directly hit by lightning and the power was knocked out. Large scale forest fires are predicted, droughts and all kinds of other calamities….. I do hope they are wrong. This stuff is the last we all need…. Save journey to the Ancestors, Klaus! We had no hydro, you see. Hydro = hydroelectric = electricity. We live18 km outside of a small town in “Cottage Country” in Ontario on a winding bumpy country road going nowhere. When there is a storm, there always is a Tree – or 2 that fall on the “hydro lines”, rip them apart and shred our ancient primitive phone line as well. End of story for a few hours – sometimes a few days. Eventually someone will show up and fix it all, but until then you = we are on our own. So is everybody else, who lives around here. Most permanent residents live along the road closest to town. Then,the further out you go, the more cottages you find. 2 km behind the turn-of to our 15000 foot driveway there are 2 lakes, surrounded by cottages. Only 3 permanent residents live there. But stuff like computers and “rocket hubs” to connect to the internet are not hooked onto this rickety system. It takes a couple of minutes to send and receive an e-mail of 2 sentences and iffff you send me a picture it will get stuck and the whole system will seize up. That was our Internet until about a year ago. Then a VERY generous friend bought us our “rocket hub”, a small device that connects us to the next tower and now we have at times a connection of up to 54 mb/sec! 🙂 The WWW and with it this blog arrived at Echo Creek. Echo Creek is actually Kawpakwakog river, the meandering waterway that flows through the back of our property, from one Beaver lodge to the next. Kawpakwakog means Echo in Algonquian. We have 106 acres of mixed bush, creek, wetlands and marsh. 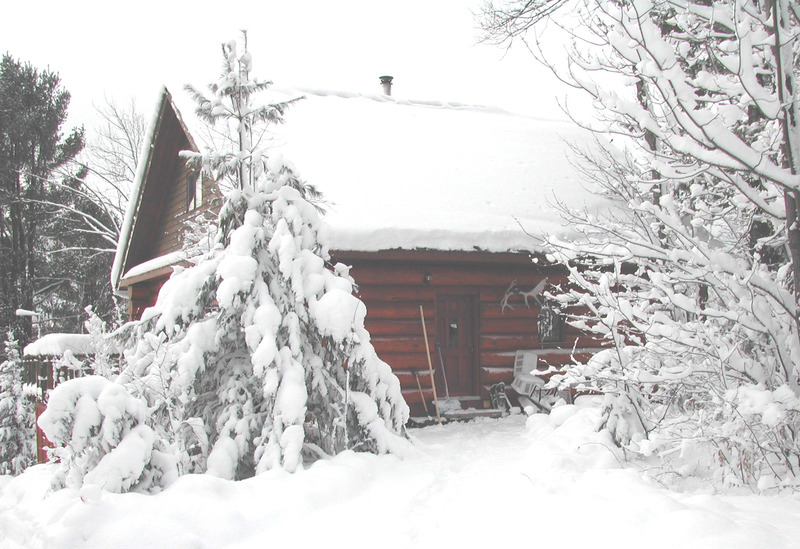 Our home made log house stands pretty much in the middle of it all, overlooking a side arm of the creek , an old Beaver lodge and several Muskrat condominiums build just last fall. Our next door neighbor is a Bear. Last fall she had 4 cubs. 4!!!!!!! I am soooo glad, that we had a mild winter. When this gang wakes up, they will be hungry and it will be tough to find food. 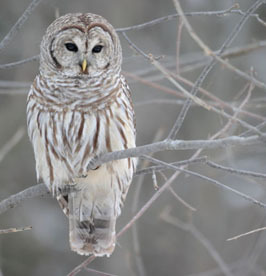 That is the time, when I have to take our Bird feeders inside at night. Right now they are the hub of activity here: Redpolls, Junkos, Goldfinches, Blue Jays and of course chickadees come and go all day long. The Tree Sparrows arrived yesterday, together with a murder of 9 Crows. In terms of Animals, we have the – still sleeping – Bears, who’s den is in the back of our land, several Wolves, that have a rendezvous site here and also a den further along the river. Then there are the obligatory Moose and Deer, Snowshoe Hares, Porcupines, Skunks, Raccoons and Foxes as well as Squirrels and – tooooo many Mice…..
Next to name is Itkli the Marten and the Fisher, who – sad to say, is forever just waiting to sink his teeth into the life blood of everybody else. Fishers are fierce and our Fisher queen is fearless as well. She is bold enough to come to the house and beg for food – but – so does pretty much everyone else as well. 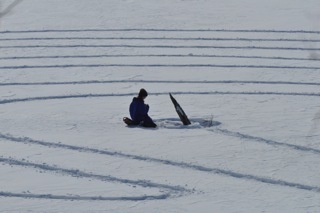 Where you to look out the window of the living room you would see our snow labyrinth. 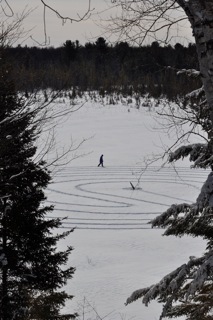 My husband Peter loves to go out onto the frozen creek and snowshoe a 7 circuit labyrinth into the fresh snow. It then becomes a wonderful place for a moving meditation or just to have a walk in the beauty of nature and clear your head. I wish you could join me.